I've been riding Steamroller a lot lately, both on the rollers and on the road. On the rollers, I ride with cages and on the road, I ride clipless. This poses a problem as I am constantly swapping out pedals on the Steamroller. Swapping out pedals aren't ridiculously difficult but an inconvenience no doubt. I was looking for good bicycle shoes so I could continue with cages only but everything I find don't seem to "work" for me. The Fixie Hipster types use skate shoes but for me they are too flexible. After searching I found these, Dromarti Storica. 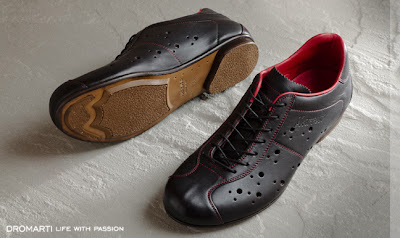 Wow, what a great looking cycling shoe.